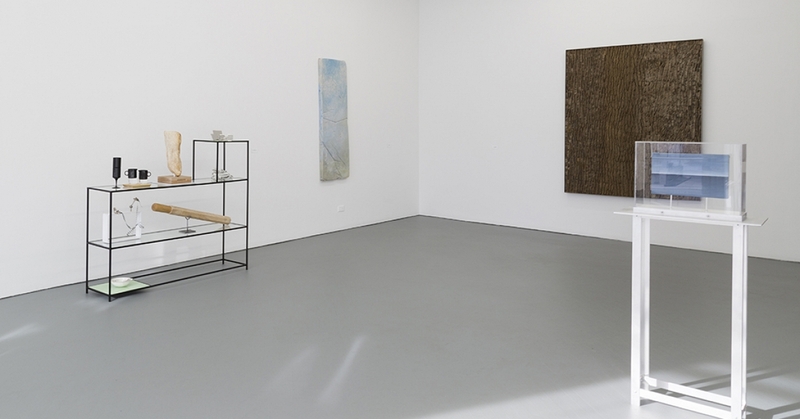 Alex Chitty once said in an interview that she arranges found objects in her work so “they seem to have always belonged together.” On display in Shane Campbell Gallery’s domestic project space, her sculptures look very much at home. 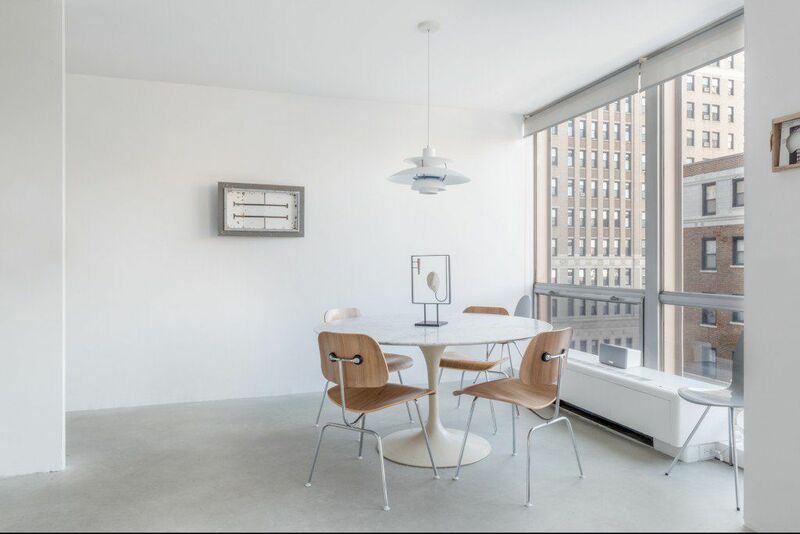 Chitty’s work dominates the show but her minimal assemblages fit right into the cool aesthetic of the apartment “gallery,” which has no open hours or attendants. Viewing the show by appointment only makes seeing the exhibit more of an experience. One of the first pieces you see upon entering the main room is Chitty’s “Ptng 11 (Slip),” an oak frame hanging above the couch with cotton rope and a brass ring strung horizontally across it. On the opposite wall hangs Bradley’s “Night Swimming,” a three-dimensional miniature replica of the building’s swimming pool. Two black lines run along the bottom of the pool, beautifully mirroring the black powder-coated steel frame of Chitty’s nearby sculpture, “30 Second Sparrow (Unit 2).” Resting on the dining room table, the black frame of the piece encloses coral and a piece of oak. Both artists, who hold MFAs from the School of the Art Institute of Chicago, made incredibly site-specific pieces. In the bedroom, Chitty has placed a small gold stand on the night table, standing in reflection to the complementary gold-wrapped Ferrero Rochers that the Campbell Gallery usually leave for guests. 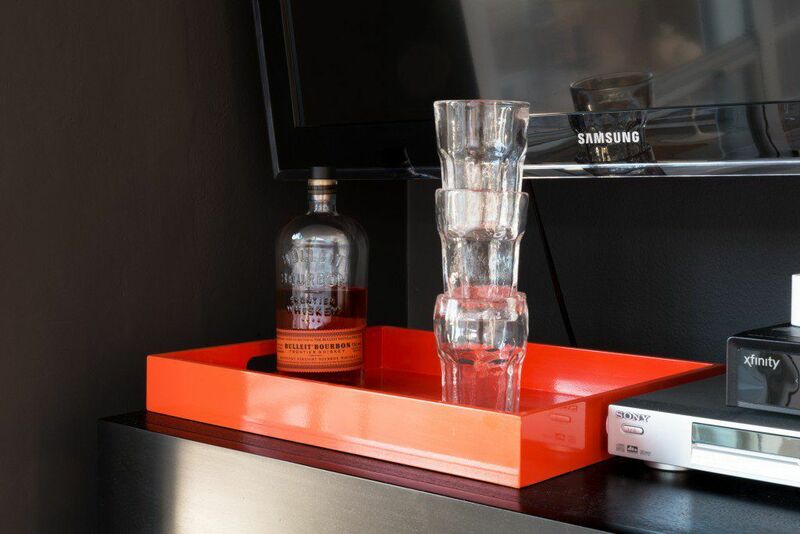 Near the entertainment center, she has placed a stack of glass tumblers near a bottle of Bulleit Bourbon. The tumblers are fused together, making it a little more difficult to help yourself to a drink. Bradley’s pieces are a departure from his more masculine installations, which often feature pizza, beer cans and home improvement supplies. Here tiny details inform his miniatures, from a cat statue to golden leaves littering the empty pool. Anyone who has wondered what the purpose of art is, or has lamented beauty for its lack of utility, would do well to see this show. The pieces make this domestic space a delight to be in; it is entirely agreeable to imagine living amongst such objects. 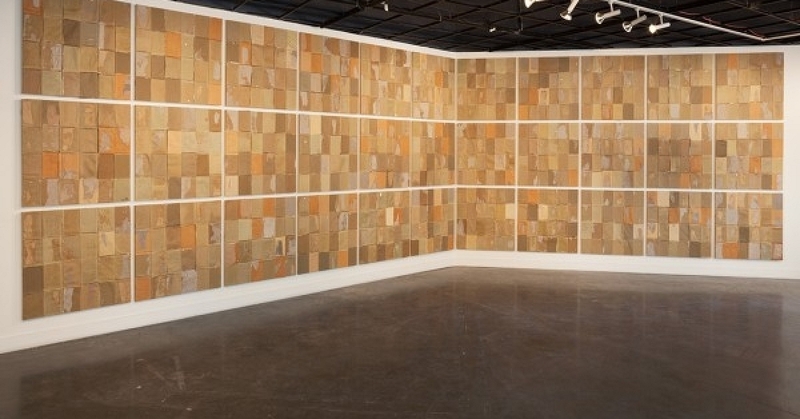 Through November 28 at Shane Campbell Gallery, Lincoln Park, by appointment only.